This yummy recipe comes from Holly Clegg’s new cookbook, Too Hot in the Kitchen. -In a large nonstick pot coated with nonstick cooking spray, saute onion, celery, carrots and garlic until tender, 7 minutes. Add both broths and oregano. -Add orzo. Bring to boil, reduce heat, and cook 5 minutes. Add Mini Meatballs (see recipe below) and continue cooking 8 minutes or until meatballs are done. Add spinach, cooking a few more minutes until wilted. Season to taste. Combine all ingredients into bowl and shape meat mixture into 1-inch diameter meatballs. 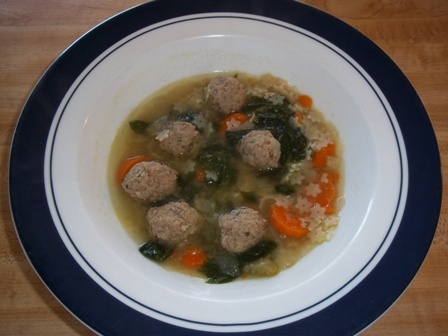 Soup makes 12 (1-cup) servings with 3-4 mini meatballs. You say orzo in the recipe but I notice you used the tiny star pasta. I always see bags of this at the mexican market 3 for a dollar but had no idea what to use them for. Thank heavens its starting to be soup weather! Sounds perfect for the fall! This was my mother’s favorite kind of soup. Thanks for the recipe. It coming the time of year when we want to stay inside and cook lots of comfort food and I love most any kind of soups! So can this be made ahead and frozen, or is this more of a make the meatballs ahead and freeze only them kind of recipe? Also, I’ve got 2 bags of spinach in the freezer, wondering if I can use them instead of fresh? 8 mos preg and trying to get the freezer stocked for hubby, since I won’t be in the kitchen for awhile after my c-section! Hi. I cooked up the entire batch, meatballs and all, and froze it. I actually forgot to add the spinach when it was cooking, so I just took the fresh spinach from our fridge and put it in the bag with the rest of the soup. It was still great once we reheated it. I think putting it in the freezer gives the flavors more time to mix. It is delicious!